During morning assembly on Wednesday 20 February, the winners of the recent Young Enterprise Quick Start Programme at Rushmere Shopping Centre were presented with certificates from Ulster Bank Representative (Newtownhamilton) Caolan Manley. Well done to the 'Bits n' Bobs' team of Joanne King, Emma McCombe, Ryan Morton, Jack Nesbitt Gareth Sloan, James Whitcroft & Jaymey Whyte. 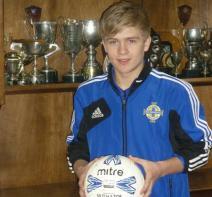 Year 11 pupil Daryl Johnston has been successfully selected for the N. Ireland U16 Schools' Football Association squad. Daryl started his footballing development at local team Tullyvallen FC and currently plays for Dungannon Swifts FC. This week will see Daryl play a friendly fixture against Burnley FC in England in preparation for the forthcoming Victory Shield Competition with matches being televised live on Sky Sports. Well done to DJ from everyone at Newtownhamilton High. Some of our Year 11 Duke of Edinburgh Award students have been invited to participate in the Mourne Mountain Adventure on the 26th-27th April 2013. This event is a mass youth challenge and has been organised through, and supported by, Newry and Mourne Council, volunteer organisations and the uniformed and emergency services. In preparation, a Briefing Day was attended by 10 pupils from Year 11, Derek and Mr Chambers, on 10th February 2013 at Castle Ward, County Down. Here the pupils got the opportunity to learn more about the Challenge itself and were able to engage in some group work, such as first aid, archery and abseiling. This preparation was thoroughly enjoyed by all; even though it was a little cold and wet! 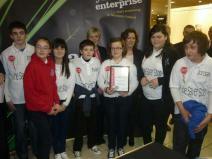 The Year 9 pupils travelled to Rushmere Shopping Centre in Craigavon to compete in the Annual Young Enterprise Quick Start competition. The pupils had set up their own companies and designed and resourced certain products and use their entrepreneurial skills to sell them to consumers. The pupils were competing against various schools from around the area and the judges decided that the companies of ‘Bits n’ Bobs’ and ‘The Saver Stop’ finished in first and second place respectively. 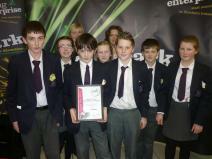 Pupils also got the chance to meet Jo-Anne Dobson MLA who was the guest of honour at the event. The Year 12 Parents' Evening that had to be postponed on Tuesday due to the poor weather will now take place on Tuesday 12 February 2013 (3.30-5.30pm). Year 12 pupils are also encouraged to attend this event. Our Community Fitness Classes are back by popular demand and commence on Thursday 7 February 2013 at 7.00pm sharp in the school assembly hall. The 6 week programme (priced £3 per session or £15 for all 6 sessions) is open to those aged 16 or over from the local and wider community. Contact the school office for registration or more information. A further fundraising activity will be an Easter Fireside Quiz - all families have been issued with 5 quiz sheets (priced at £1 each) and are encouraged to sell these and return the money to the school office on or before Wednesday 13 March 2013. Additional copies of the quiz are available from the school office. All the winning entries will be drawn out of the hat during the Non Uniform Day (donation of £1 per pupil) which is also being run on Friday 15 March 2013. Prizes have been kindly donated by Graham Park Butchers, Fane Valley and School Association Members.